A hot and heavyset fog hangs over the coastline. I ride along glistening sand but the ocean is nowhere to be seen. The cloud blanket can't be more than a few dozen feet high and I can still feel the blistering sun on my skin. I only have a couple of hours to ride before I have to be at the airport, so I ride as fast as I can muster on the missionary bike with the bouncy tires and blistering seat. Since I can't see the ocean, I turn off the Pacific Coast Highway and veer up the bike path along the Santa Ana River. I have this vague idea that if you ride far enough inland in Orange County, you hit mountains, or at least hills. The fog dissipates into a gray haze and the path turns to dusty gravel. The river corridor is lined with sun-faded houses and exotic-looking crops. Multiple signs warn me not to drink the irrigation water. I ride beneath freeways and skirt the edge of massive industrial complexes. The river itself fades from flowing water lined with grass, to stagnant water and marshes, to mud flats, and finally to stark concrete. A thin strip of brown water trickles down the manufactured channel. I stop and look for the haze-obscured hills. The next day, I'm in Sandy, Utah. Delta Airlines couldn't find a space for me on their nightly flight to Anchorage, so I'm spending a bonus day with my family. I have a little bit of time before I have to return to the airport, so I go for a run. 40 and 50 mph wind gusts tear down the streets and the air is choked with dust. I can't see the mountains to the east or west, only a thick brown mass swirling into gray sky. I sprint with the wind at my back, past my former middle school, past my old high school. I laugh at the student drivers in their matching, lurching cars. I reminisce about the time I almost joined the cross country team until they sent me out to run two miles around the neighborhood streets. I remember that I quit because I had never experienced anything so simultaneously boring and painful. I reminisce about the time that freckled blond kid in my English class rode by on his motorcycle as I was walking home from school, then turned around, stopped, and gave me a ride. I smile and fly north, carried by an unholy wind that I don't even recognize until it is time to turn and face it. For two miles I plow into an invisible wall, holding my hand to my forehead to shield it from blasting sand. I squint until the world is a blur of uneven shapes. I feel suddenly bewildered by this place I know so well. The next day, I'm in Anchorage. I spend the morning working on my resume and cover letters, so I decide to reward the afternoon with a "research" trip around this city where I supposedly live. The fact that I'm not going back to Juneau still bewilders me. There's a reason I ripped myself out of my comfort zone, but the truth is I'm still looking for it. In the meantime, I'm only wandering. 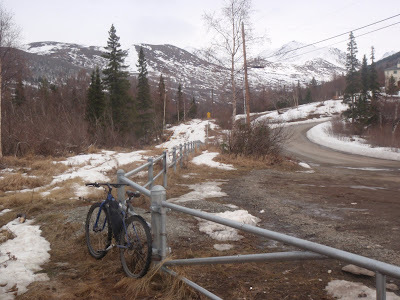 I ride south on the Coastal Trail and marvel how most of the snow is already gone. I loop around Kincaid Park and grumble about how much snow and mud is still covering the singletrack trails. I zig-zag through the south part of town, end up on some rough trail near Campbell Creek and find myself ducking beneath the Seward Highway in a rocky underpass scarcely taller than me. I climb into the foothills, where the streets are lined in rippled layers of snow and the mountains capture streaks of silver sunlight filtered by an overcast sky. The city is far below me now, sprawled across the valley on a scale that was familiar to me a long time ago, but feels more foreign now. I try to pick out the neighborhood where I reside, but the orientation isn't there. I grasp for a sense of place, but it slips away in the wind. I feel a rush of new perspective, because I don't know where I am. I really like this post, almost like poetry. 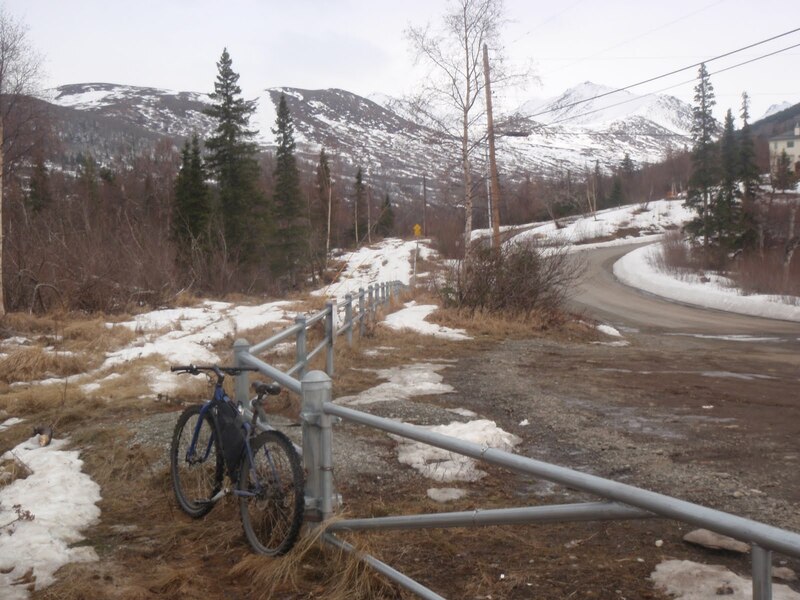 I love how our bike path crawls under the Seward Highway beside the river... and that it still gets year-round use! Eloquently written. Remember: "Wherever you go, there you are!" All kidding aside, your statement is more than knowing your physical surroundings. Are you lost career wise? Second guessing your decision to return to Anchorage? Don't answer these ridiculous questions. I'm searching . . .
Ride, ride, ride . . . .
Ah, you're in Stuckagain Heights, at the top of Far North Bicentennial Park. I hit that climb most weeknights. You can train pretty hard if you only have an hour to ride. Once the salmon runs start, watch for bears in that area. 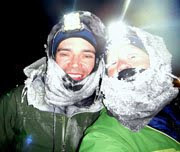 Stumbled across your blog because my husband grew up in Anchorage and is always raving about it. Made me happy to see that you were a fellow Utah girl like me, so "Hello" from Riverton. Your pictures are beautiful, I'll have to show them to my husband. He'll be thrilled to see pics from 'back home'.